Let’s take a look at how we can break this down. If we want to know the exact value of π, we need to know two things about a circle: we need to know its diameter, and we need to know its circumference. By far, the easier of these to ascertain, when performing compass-and-straightedge geometry, is the diameter. Given a starting point, we can (theoretically) construct a circle with any arbitrary diameter that we would like. Therefore, let us simplify our discussion as much as possible by taking as our model the simplest possible circle: a circle with a radius of 1. Given that the radius is 1, we know that the diameter is 2. So, now all we need to do is to figure out the circumference of the circle, and we can calculate the exact value of π. Now, let’s consider another figure: a regular hexagon. This six-sided polygon has been very thoroughly explored by geometry, and its properties are much simpler to derive from very little knowledge than those of the circle. However, just like the circle, a hexagon is a closed plane figure which is symmetrical about a central point. In fact, it is possible for us to consider a hexagon and a circle which both share a centerpoint such that the apothem of the hexagon is equal to the radius of the circle. The apothem, if you did not know, is the distance from the center of the hexagon to the midpoint of one of its sides. 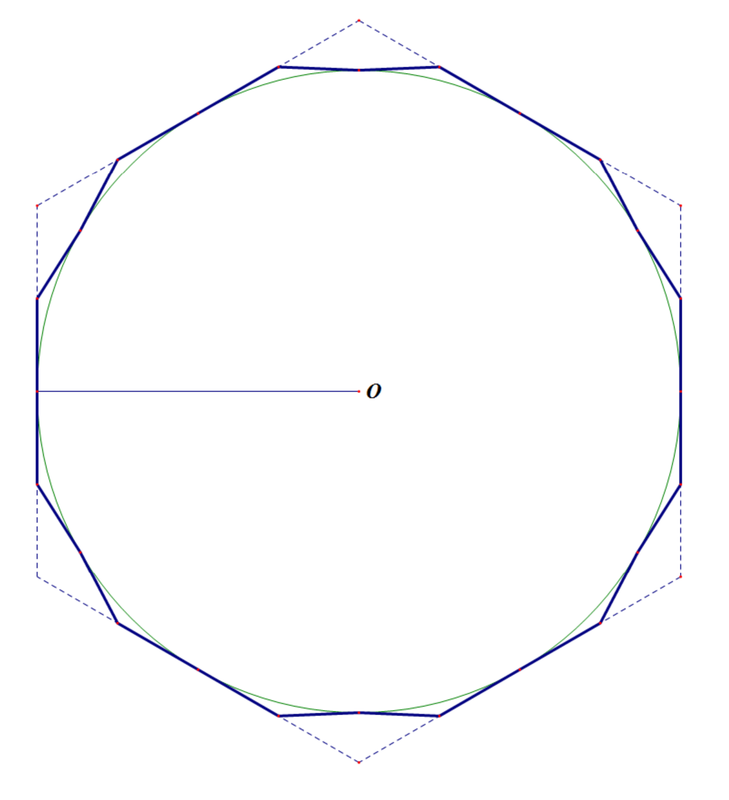 Perhaps the perimeter of such a hexagon might give us some approximation of the circumference of the circle. Take a look at Figure 1, below. 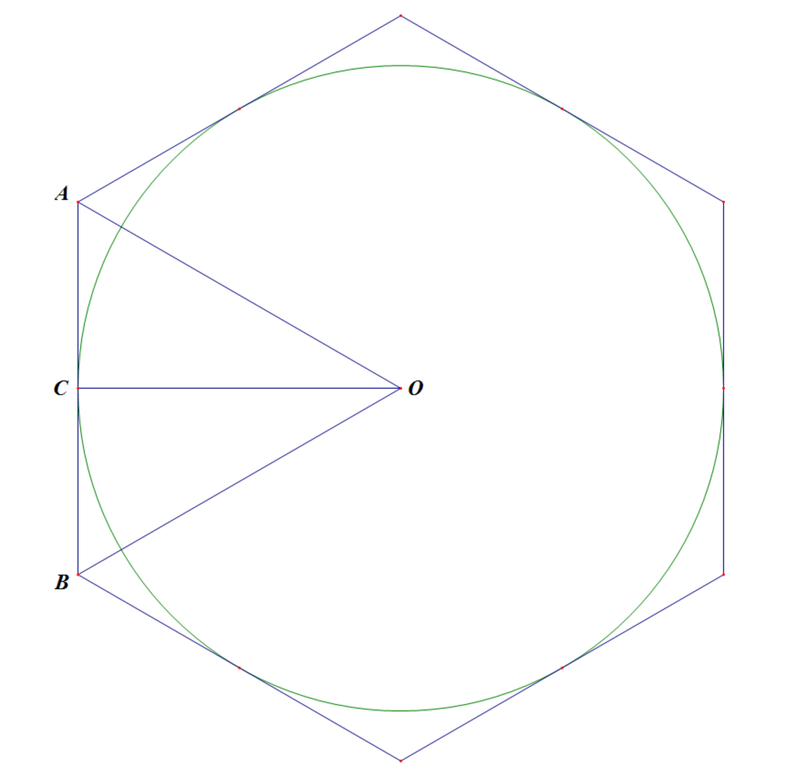 In this diagram, the point O is the center of both the circle and the hexagon, while is the radius of the circle and the apothem of the hexagon. One interesting thing to note, here– which will be useful later in our discussion– is that is an equilateral triangle. Now, our goal is to find the circumference of the circle, and we were hoping to utilize the perimeter of the hexagon for this task. However, it is immediately apparent from Figure 1 that the perimeter of the hexagon is far larger than the circumference of the circle. Perhaps we can find better shape, one whose perimeter is much closer to the circle than the hexagon’s. In Figure 2, we’ve constructed a regular dodecagon (12-sided polygon) whose apothem is equal to the circle’s radius, centered on point O. As you can see, its perimeter is much closer to the circumference of the circle than was the hexagon’s. Still, it is immediately apparent that the perimeter of the dodecagon must be greater than the circumference of the circle due to the clearly visible distance of the vertices from the circle. If we again double the number of sides, drawing an icosakaitetragon (24-gon), we’ll notice that the vertices come even closer to the circle. Archimedes performed his famous calculations on the circle using nonacontakaihexagons (96-gons), which would look like Figure 3, below. At this point, it becomes virtually impossible to distinguish the nonacontakaihexagon from the circle, with the naked eye. However, if we were to zoom in, incredibly close on this image, we would find that the vertices still don’t quite touch the circle. The important thing to notice is that with each doubling of the number of sides, those vertices approach closer and closer to the circle. Now, Archimedes was incredibly advanced, for his time, and while he dabbled in some concepts which would later become fundamental to Calculus, he did not have that bit of math as a fully developed tool with which to perform his work. We do have this too, though, and we can utilize it, here. We can clearly see that, as the number of sides of the polygon increases towards infinity, the distance between the vertices and the circle approaches zero. If we were to construct an infinitely-sided polygon sharing a center with a circle, and which had an apothem equal to the circle’s radius, then all of the points of that infinigon would lie on the circle. Effectively, the perimeter of the infinigon then equals the circumference of the circle. Calculus will allow us to determine that perimeter, exactly, and therefore we can determine the exact value of the circumference of the circle. This, in turn, will allow us to compare the circumference to the diameter in order to calculate π. In Figure 4, I’ve zoomed in on a diagram which will aid in our calculation. 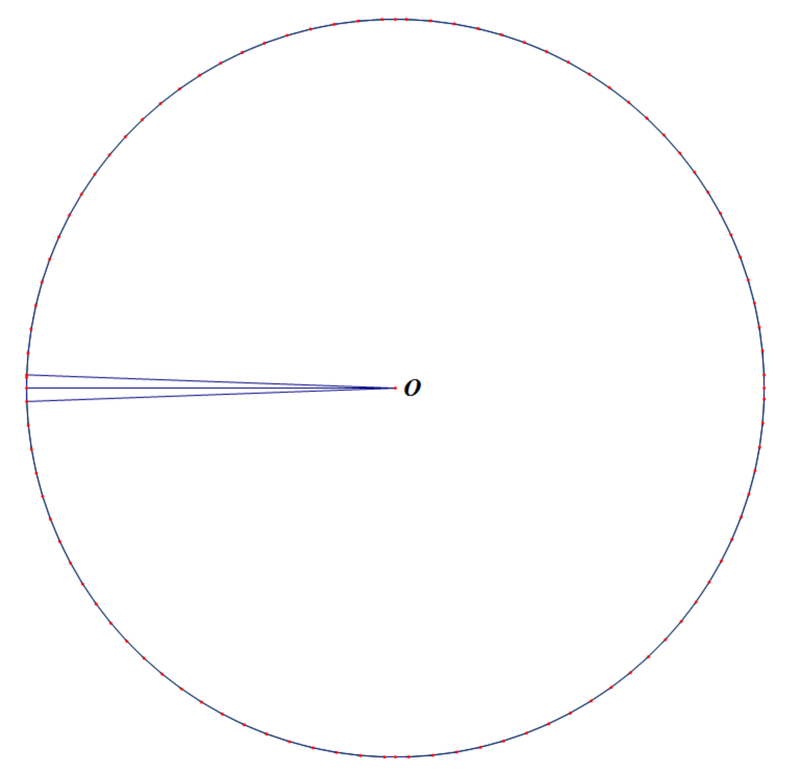 In this diagram, O is the center of the circle. The segment is the radius of our circle, and will also be the apothem of our infinigon. The segment is half of the side of a hexagon with apothem . Now, if you remember way back when we were discussing Figure 1, I mentioned that it was important to note that the triangle formed by a regular hexagon’s center and the endpoints of one side of that hexagon is an equilateral triangle. 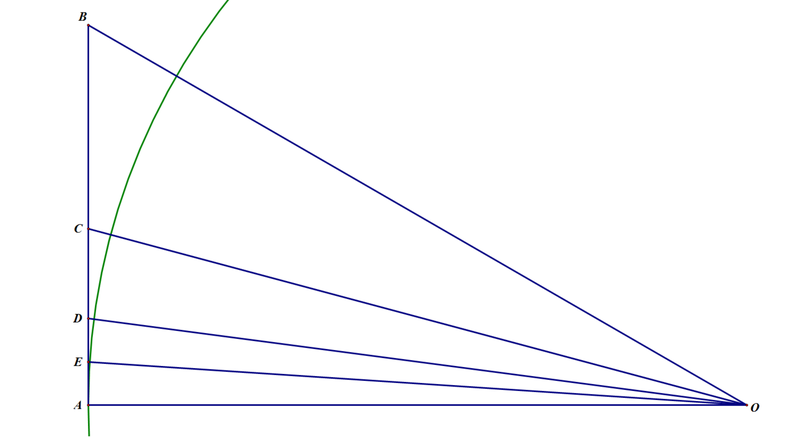 Since our diagram in Figure 4 is only dealing with half of a side, we know that is half of an equilateral triangle, and from that information– since the radius of the circle has a length of 1– we can determine that has a length of . The segment is half of , but it is also one half of the side of a regular dodecagon with apothem . Similarly, is half of and half of one side of an icosakaitetragon; while is half of and half of one side of a tetracontakaioctagon. This yields a general pattern: one side of the n-th doubling of the number of sides of a polygon, starting from a regular hexagon, will yield a value exactly times the length of the apothem. Since this gives us the length of the side, and since the number of sides is , we can multiply these numbers together to yield the perimeter of the polygon. Taking the limit of this formula as n goes to infinity gives us . Therefore, the circumference of the circle is 4√3. Since π is the ratio of the circumference to the diameter, and since we now know both of those values, it is very simple to calculate . Quod erat demonstratum! The main lesson I’m attempting to demonstrate in this post is that a person can quite easily make an intelligent sounding argument for a claim which is, in actuality, entirely preposterous. No, I have not actually proved that every mathematician since Archimedes’ time has been grossly underestimating the value of π. However, I have presented an entirely false claim with just enough mathematical disguise as to make it seem plausible to someone who might not be well informed on the subject. I utilized the tools and language of mathematics, but I utilized them improperly in order to demonstrate my conclusion. Why would I go through all of this trouble? Because this morning, I stumbled across this post on the Wintery Knight blog. The author of the blog contends that, because William Lane Craig published an article on the Kalam Cosmological Argument in a peer-reviewed astrophysics journal, it has now been shown conclusively that atheism is incompatible with science! Of course, the author neglects to mention that the article in question was published 15 years ago in an extremely obscure journal which explicitly states that it includes “topically selected special issues” from non-scientific fields. William Lane Craig is not a scientist, nor is he even a philosopher of science. He is a philosopher of religion and a theologian who dresses his arguments in just enough pseudoscience to make them appear conclusive to the ignorant. William Lane Craig might as well have published an article in that journal proving that π=2√3. Incidentally, if anyone is interested in other false proofs of this sort, you can find them all over the Internet. For example, here’s a video of Vi Hart discussing similar false proofs about π; and for another, here’s a video of Carlo Séquin proving that all triangles are equilateral. Another great piece. A potential spot: “Quod erat demonstratum!” Shouldn’t it be the gerundive ‘demonstrandum’ here? An irrelevant observation given the content but it seems a shame to mar the article! I’ll be completely honest: that was an unintentional mistake, and I thank you for pointing it out. However, I think I’ll leave it uncorrected in the article. It’s just one more intelligent-sounding-but-actually-erroneous bit included to further the point. The only way to resolve the square of the circle is to do a final Archimedes Volume test with water! I have done this. If we compare 3 attempts to square a circle we must include even the volume of the measure unit itself. Drawling lines and squares in a form or platform takes up volume! Math deludes us as its unit is a volume. You can see this clearly when you calculate ratios with different units of measure. They are all slightly different in the decimal series!